Reported by Reuters earlier this week, police officers in Cape Town, South Africa have started confiscating mobile devices from the public when being used while driving. A new by-law went into effect this week which gives police the authority to seize all handsets for a period of 24 hours. Within the first hour of peak traffic that the by-law was active, police confiscated 16 phones from drivers chatting away while behind the wheel. Once the phone has been seized, it is placed inside a sealed box and impounded at a traffic station. The driver is given a serial number and can pick up the phone at a traffic office after the 24 hour period expires with proper identification as well as the serial number. However, the offices are closed on the weekend. If a driver gets busted using a phone on Friday, they won’t be able to get their hands on the phone again until the following Monday. Motorists in Cape Town have to pay a 500 rand ($61.50) fine and could face jail time up to three years for the offense. However, drivers are allowed to use a hands-free kit to talk on a mobile phone while operating a vehicle. One positive aspect of the seizure process is that drivers are allowed to remove their SIM card and memory card before handing the phone over to the police officer. This allows the driver to protect personal data on the memory card in addition to using the SIM card in an older phone on a temporary basis. The entire process of stopping a driver talking on the phone and confiscating the device takes about 15 minutes per incident. According to a report on the Independent Online, driver reactions to losing their cell phones ranged from anger to shock. In the United States, only ten states and the District of Columbia prohibit all drivers from talking on a cell phone while driving. 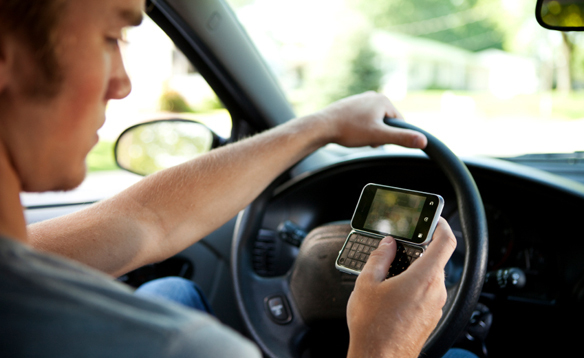 However, 32 states ban all cell phone use among novice drivers and 39 states ban sending text messages while driving. According to a National Traffic Safety Board (NTSB) study cited in The American, dialing a phone number while driving increases the probability of crash by 2.8 times. In addition, talking or listening on a cell phone while driving increases the probability of crash by 1.4 times. As outlined by the NTSB, 32,885 fatalities from traffic accidents were recorded and less than ten percent of the accidents were attributed to distracted driving. Beyond talking or texting on a cell phone while behind the wheel, the category of distracted driving also includes having conversations with other passengers, attempting to fiddle with the radio, eating or drinking, working through an intense emotional state or simply daydreaming.